RUGBY UNION: He coached them for four years, and his England will face them next week, but clearly Eddie Jones has forgotten about the Wallabies. Either that or he simply didn't rate Australia's performance in the recent Rugby Championship. Granted, the All Blacks were the dominant force in the competition this year, winning all six of their games, but the Wallabies finished second on the table with a 3-3 win-loss record. Jones, however, rated Argentina more highly than Australia, despite the Wallabies claiming a convincing 36-20 win over the Pumas, who finished with a 1-5 record. England hosts Argentina at Twickenham on Sunday (12.30am AEST). "This game against Argentina is a big step up for us as they were probably the second best team in the Rugby Championship and played some exceptional rugby,” said Jones, who remains unbeaten in 11 games as England coach. "They are a quality team, have power in the forwards, speed and guile in the backs as well as great experience. "We appreciate they have threats across the field and they have always been a physical, tough side. 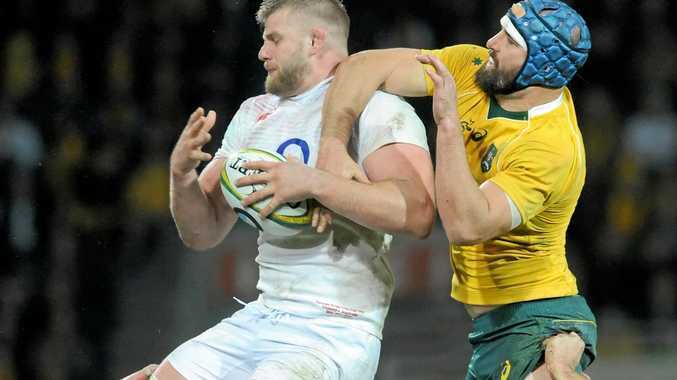 Jones recalled lock George Kruis, who has recovered from an ankle injury, to his starting side as one of four changes to the team that beat Fiji 58-15 last weekend. "Selection was interesting this week but it shows how competitive and how much depth we are developing,” Jones said.